Edwards Language School offers a wide variety of professional English language courses! From Ealing Broadway Station turn left, walk down to the traffic lights and turn left – this road is The Mall. Walk for 200m past the shops until you reach a pedestrian crossing with traffic lights. Cross the road, turn left, cross Florence Road, and you’ll find Edwards Language School on the right. It's a 5 minute walk from Ealing Broadway station, which is on the District and Central Lines, and 20 minutes from central London (Zone 3). Ealing Broadway is also a British Rail station where there are frequent trains to and from Paddington Station (10 minutes) and Heathrow Airport (20 minutes). Buses to Ealing: 207, 427, 607, 83, 65, 112, 297, E1, E7, E8, E9, E10, PR1 and N207. Alternatively, you can walk from Ealing Common underground station (District and Piccadilly lines). We always need homes in Ealing, London to host international students. Please contact us if you are interested. Contact the school to hear about any special offers. 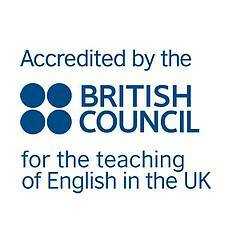 We are accredited by the British Council to ensure we deliver the highest quality in English language training.